Bear Family Address Plaque -- consists of four individual bear shape signs: one large bear (a mama bear or papa bear) and three baby bears out on a walk. 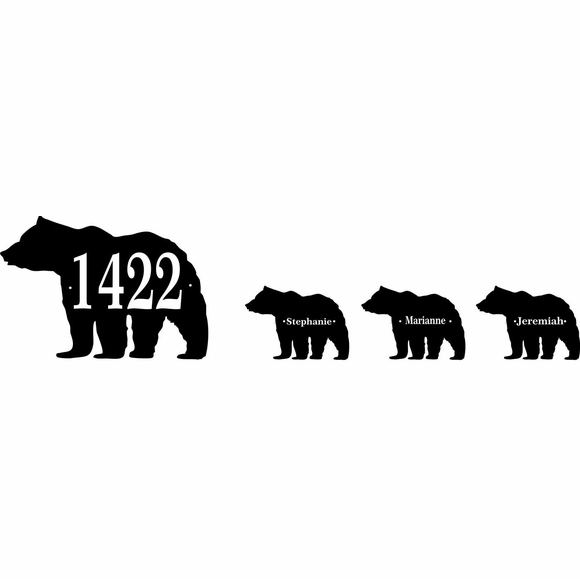 The large bear displays your house number, and the baby bears are personalized with their names. Made in USA. Wall mount. Please make sure you have adequate wall space for the bear family you want: big bear is 12" wide; baby bears are 6" wide. Be sure to allow for room between the bears. This wilderness theme bear family sign is perfect for a home or business is located in bear country or for a city dweller with a soft spot for bears. The large parent bear includes one line of personalization with up to four (4) 3" characters at no extra charge. The baby bears can be blank or can each include one line of personalization with up to ten (10) 1/2" characters. Note: when you order this address plaque in white with black characters, the white bears look like a Polar Bears. Big bear measures 12"W x 8.5"H x 1/8". Baby bears measure 6"W x 4.25"H x 1/8". If you need additional bears, please contact us. Click the links in Related Products to see more bear products and special shape novelty signs.